Ok, I hope this makes sense. Go to 'layout' (either from dashboard, customize or when you sign in, you'll see it). 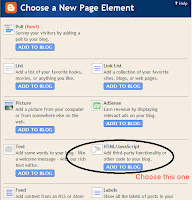 You'll be at "Add & Arrange Page elements", and at the side "Add A Page Element" & click on that one. Make a title & put in the HTML code (scroll down to see how to make the HTML code). After you save it, it will bring you back to the "Add & Arrange Page Elements". Put your mouse over the box, left click/hold, drag to where you want it. If you plan to keep it on the side you need to make the picture really small. For my site I had to resize (scale) an etsy banner to approx 247 X 32 (instead of the 760 X 100 that we use on Etsy). If you scroll down on the side, you will see my banner. Is this clear? I hope so.